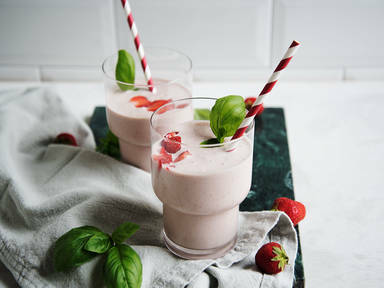 Add cashews, frozen strawberries, basil, lemon peel, oat milk, dates, and salt to a blender. Blend on high for approx. 1 min. or until combined. Wash, hull and quarter strawberries. Fill shake into glasses and garnish with basil and strawberries on top. Enjoy! Find this recipe and more quick treats by Sebastian in his cookbook "Fit-Mix" (ZS Verlag).